It is so hard to have multiple children in your care. It is, it can be exhausting and daunting to be responsible for so many little lives. 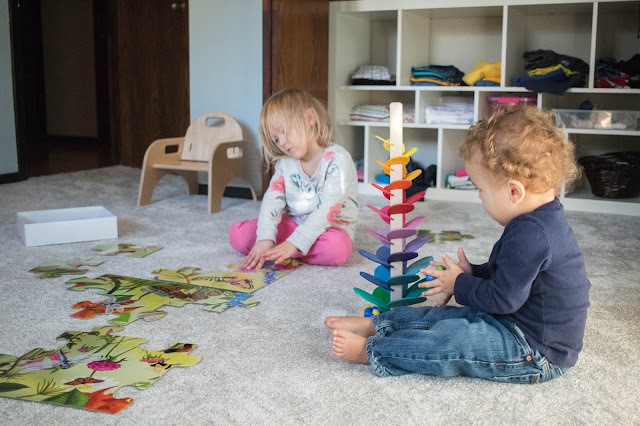 While there is a lot of joy in watching your children play together, there are also times when there is a lot of conflict. This post is going to answer the question that I get more often than ANY other question I am asked - how do you manage sibling conflict? My children are like any other siblings close in age. They can squabble over the same books or toys, they can lash out in anger, they can push/hit/bite/scratch. It happens. Especially between Nora and Gus who have a closer age gap and very similar personalities. They tend to push each other's buttons much more than Henry and Nora did, or that Henry (being so much older) and Gus. But, it happens between all of them. And, it's up to me to respond. So, what do I do? Here are some things to try and keep in mind in order to manage sibling conflict in your home. All examples here are just examples. Me: "I see Nora is using the pumpkin book. I hear Gus would like to read the pumpkin book. Gus you seem upset. Nora doesn't seem done with the book." Pause. Me: "Gus and Nora will read the book together." Now, sportscasting is not something I created, it's an RIE method for handling frustration and conflict in children. You can learn more about it here and here. 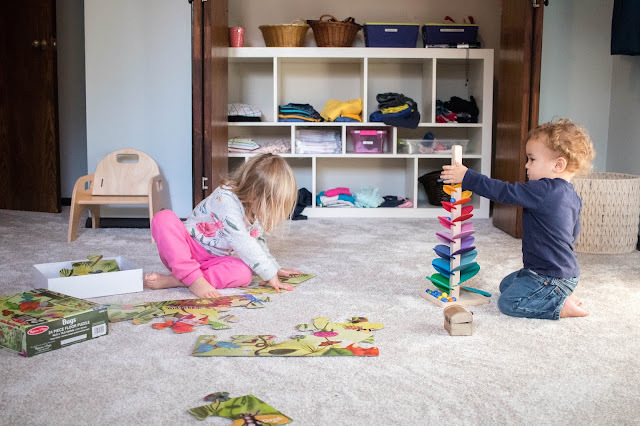 I find it is completely compatible with our Montessori lifestyle. And, this isn't something I always get right. It's something I'm working on too. Staying neutral and observational can be difficult. But, it really does seem to give the children enough framework to think about the issue and try to solve the conflict. Gus works with this marble tree. Me: physically stops Gus by placing my hand to his chest and holding him back "Gus, I will not let you bite Nora." And, I will continue that for as long as I need as we sportscast and resolve the conflict. Here, by not removing the child everyone gets a chance to own the solution we come up with. No one is being blamed for their emotions. And, everyone is kept safe. It's not always easy for me, but I know in the end, they will be able to solve more conflicts on their own by getting this practice now. Another situation where I am physically blocking one child is when another child is in deep concentration. We all know this scenario. One child is working peacefully and the other child comes up and disrupts the whole thing. The first child is upset and may lash out or abandon his/her work. It's frustrating for everyone. And, you just aren't going to be able to stop that from happening all the time. I know I can't. But, I do try when I am able. Concentration is so important to me as a Montessori parent. I want to protect it. If one of my children is concentrating, I will stop another child from interrupting. By getting down on that child's level and saying "it looks like Gus is working with that puzzle right now. Let's find another spot to play" or "look Gus is working here! Would you like to go read a book with me?" Something like that. I don't base this protection on age, verbal ability, interest or anything like that. But, simply on which child is most deeply concentrating. Again, stay neutral and calm. It's often not intentional on our kids, and sometimes even just pointing out that work for one of my children. I feel it's helped them each learn to expect space while working, and give space while another is working. This was especially true when I had a baby in the house. That baby always wanted what the older sibling had. 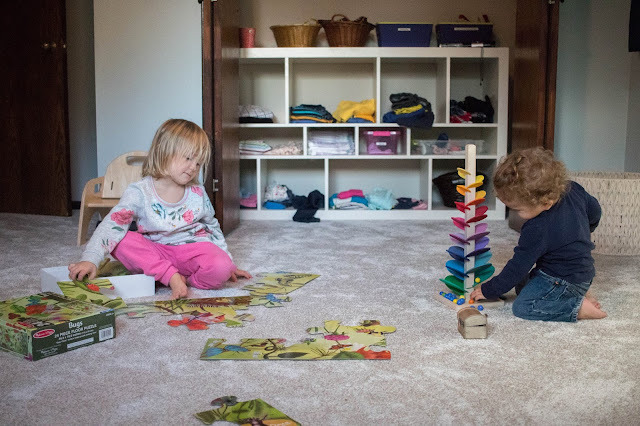 So, just sitting there and redirecting, while exhausting, helps to establish boundaries that become so important for children as they get older. 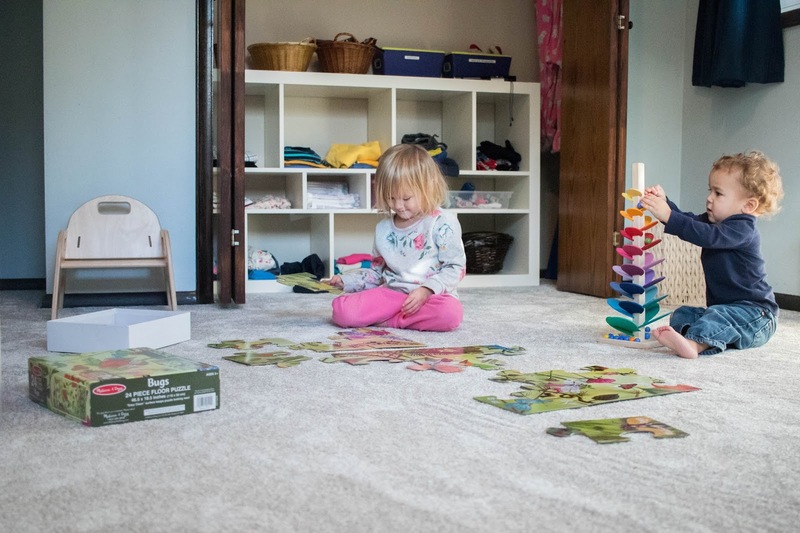 Nora works with this puzzle. I find that sometimes I get stuck in a pattern of managing conflict. Jumping from one thing to the next without looking for that root cause. Then, I wonder why does this keep happening? But, often if I sit and observe, even during those times where the conflict isn't evident, I might see why. So, take time to observe. Observe when things start to get heated, but also when they aren't. Observation is such a powerful tool for any Montessori parent. Up until now, all of this has been about my intervention - my response to conflict. But, managing sibling conflict also means understanding when NOT to jump in. I can't jump in at every turn. An important part of offering my children independence is allowing them to figure it out sometimes. It means ignoring those little annoying sibling squabbles and giving them space to work it out. This is especially true for my older children. I cannot be the one in charge of monitoring their every conversation. And that means letting go of a little control. It means there will be times when they speak rudely to one another, or say hurtful things. We can talk about that (after the fact, see below). But, in those moments, they need to have a safe space to learn how to resolve conflict alone. Otherwise, how will they be able to do it in the real world? If these things are met, I give them a chance to deal with the situation. I may listen and stay close and be ready to sportscast. But, first they have those moments. Even with all of these things in place, conflict still happens, and a child can get hurt. My children are not immune from pinching/biting/hitting each other. It happens. Again, it's my job to respond calmly and compassionately. My job is NOT to shame or punish or lose my control. It's NOT to place blame. So when someone is hurt, I comfort. Genuinely. I turn my attention to the one that is hurt. I offer hugs, acknowledge feelings. And often, the child who hit/bite/pushed/etc. will come and see this and apologize on his/her own. By seeing my comfort, they can understand the hurt they caused. This doesn't mean that I never address the situation with the person that was aggressive. I just don't do it in the moment. Emotions are usually too high for that to be an effective moment to talk about it. Instead we revisit the behavior (not the specific incident) at a more neutral time. Depending on the age of your child this can look different ways. For an older child, it may be that you sit down and have a talk about how to manage the conflict. Come up with a solution together. 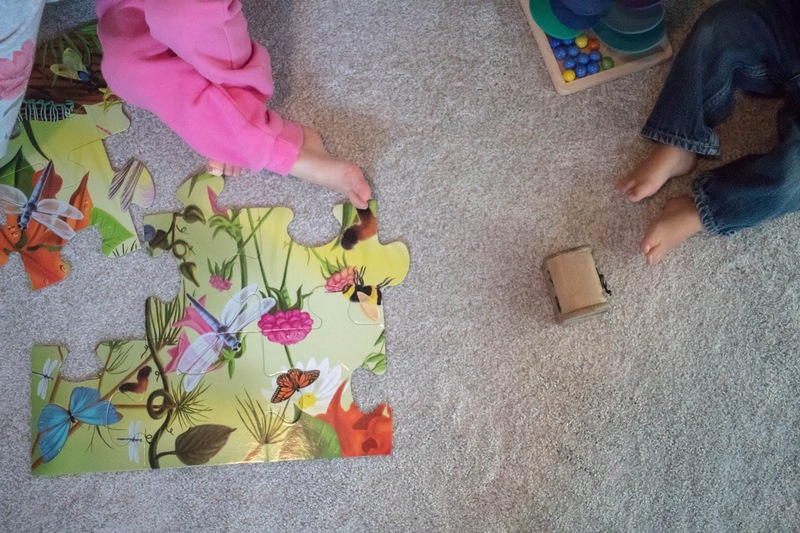 A preschooler may just need a clear explanation and to role play the situation. For a really young child, you need to change your behavior. Give less space, model gentleness and know that time will help. A baby and young toddler shouldn't be expected not to lash out. It will be your job to change your own expectation and step in where needed to keep everyone safe. How do you manage sibling conflict in your home? Are any of these strategies familiar?